I first discovered Elite growing up in the Eighties. It was a simpler time and Elite made a huge impact, the freedom to travel to distant stars and meet or trade with Alien races was irresistable. Sadly even back then entertainment companies were already trying out crazy methods of protecting their products from copying and the Elite version I played had the most ridiculous copy protection seen before or since (you think DRM is bad). Known as Lenslok, some bright spark decided that in order to prove you were the rightful owner of the game you would need to put a viewing square up to the screen so you could then decode the characters revealed. The problem was it was so difficult to make out what the characters were that nine times out of ten you never got to play the game. Sadly this meant I never got to enjoy the world of Elite as much as I'd have liked, (although I did read the quite fantastic Robert Holdstock novella The Dark Wheel that came with some versions of the game). That is until Frontier made an appearance on the Amiga in 1993. Frontier, like it's predecessor was a ground-breaking game and once again evoked the freedom of a galaxy to explore. Fast forward to the 21st Century and "Elite: Dangerous" began life as a kickstarter project - developed by David Braben the original Elite developer. It is already looking very promising indeed, so much so that it may very well live up to the legacy David Braben and Ian Bell created in 1984. Allen Stroud is another soul who lost his heart to Elite, so much so that he has lended his talents to the new Elite game. This includes a novel largely set within the system every Elite player will be familiar with - Lave. 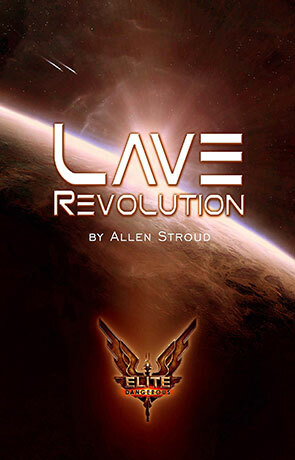 Lave Revolution is not just about the change in government of that system, there is a lot more going on than that. Right from the start there is a great deal of action, adventure and use of the Elite ships that play such a large part in the games. The book is superbly crafted, an epic space adventure that has a finely twisted plot, rich characters and a blistering pace. It's one of those books that once you pick up you just can't put down. The authors voice is clear and distinct, Stroud has a rare way with words that really engages and disarms the reader. In parts humourous, in parts shocking and towards the end somewhat bittersweet, the author manages to play with the readers emotions effectively. It's an immersive and rewarding experience. What's more is that Lave Revolution lives and breathes Elite. The author has got the feeling of the Elite universe, the ships, the technology, the politics and the people absolutely spot-on. From one who has played all the elite games so far (and I do plan on playing the new one at some point), Elite: Lave Revolution is inspired and a welcome addition to the Elite Universe. Written on 20th August 2014 by Ant.